Strawberry Cream Cheese Icebox Cake! Clean and slice strawberries (about 1/4 inch thick); set aside. You have to do this first because the cream cheese mixture will start to set up quickly once it’s mixed up. Line the bottom of a 3-quart 13x9 baking dish with graham crackers; set aside. Mine easily fit 6 whole crackers then I had to break up a 7th one to fill in the rest. Combine cream cheese and sweetened condensed milk in a large bowl and beat with an electric mixer until smooth and creamy. Add pudding mixes and milk and continue mixing on low for 4-5 minutes or until mixture starts to thicken. Fold in 2 cups cool whip until smooth. Pour half of cream cheese mixture over graham crackers. 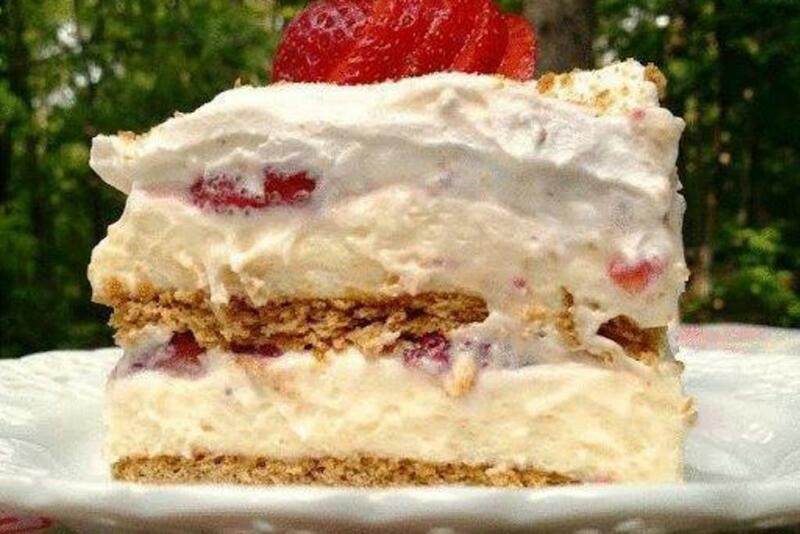 Arrange a single layer of strawberry slices over cream cheese mixture. Top strawberries with another layer of graham crackers then cover with remaining cream cheese mixture. Top cream cheese mixture with another layer of strawberries. Cover and refrigerate for 6-8 hours. When ready to serve, top with remaining cool whip. Crush remaining graham crackers and sprinkle crumbs over cool whip.